The purpose of this tutorial is to demonstrate how to add a Select control to a form using AppStudio. You should have completed the A Simple Program tutorial before beginning this tutorial. The program to be developed will start out creating a form with a Select control. It will then show how to populate the Select control and detecting when the user has selected a value from the list. A Select control allows the user to select from a list of choices. The Select control looks like a single line text box until the user clicks on the box causing a drop-down list to appear. The user can select one of the items in the list. An Event is generated when an item is selected. Start AppStudio from the Start menu. Drag a Select control object from the Toolbox to the Design Screen. The object is automatically selected as indicated by its border. Set the ID in the Properties window to "selWeekDay". The Combo Box will display as selWeekDay in the Project Explorer window. Drag a TextBox object from the Toolbox to the Design Screen. The TextBox will appear on your form as a rectangle with the default text 'Enter text here'. The object is automatically selected as indicated by its red border. 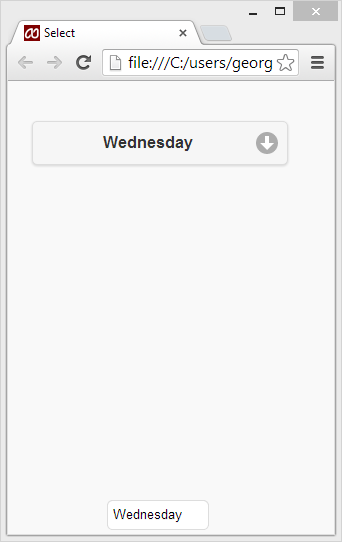 Set the ID in the Properties window to "txtDay". The Text object will display as txtDay in the Project Explorer window. Scroll down in the Properties window and click on 'Readonly' and select the read only option. We need to add code to initialize the Select control with items for the user to select. The For...Next loop initializes the Select control with the days of the week by cycling through each weekday name (index 0 thru 6). 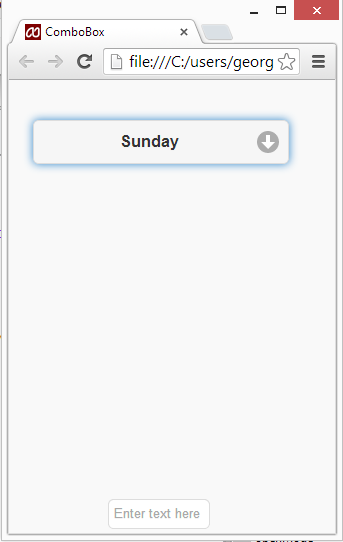 WeekDayName is a function where index 0 = Sunday, index 1 = Monday, etc. 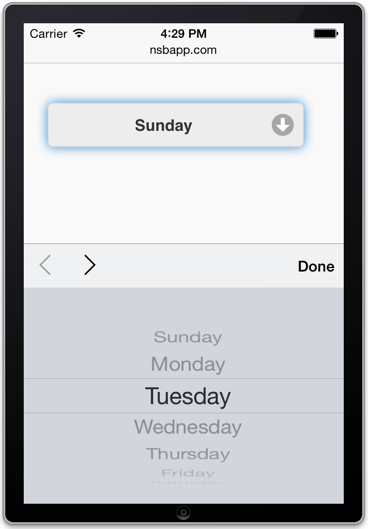 By looping through index 0 through 6 we add each day of the week to the Select control object. Sub Main() is called once all the controls are rendered on the screen. We can then add items to the Select control. There are several ways to test the program in a suitable browser. Press F5 to save and start the program. Click the Right Arrow button on the toolbar. The Select control program we just built allows the user to click on the list and select a day of the week but does nothing with the selection. Let's modify our code to detect when the user has clicked on the box and display the selection in the Text Box we created named txtDay. In the Project Explorer, click on 'Code' beneath Form1 to return to the Code Window. The first and last lines define the begining and end of the function that will be called when the weekday is changed in the selWeekDay combo box. The second line is executed when this change takes place and takes the selected value and writes it to the txtDay text box. This code change will update the text box every time the user clicks on the combo box. Once again, press F5 to start the program. Like all objects, Select control has a number of properties, methods, and events for using and configuring the Select control. You can see all of these in the Properties Window once you select a combo box on your form. They are also available in the AppStudio Handbook or by viewing the online documentation. Listed here are some of the more common ones you will use in your programs. This page was last edited on 3 April 2014, at 22:27.